This verse by John Clare is the first of Autumn, part of his monumental poem The Village Minstrel written in 1821. John Clare was born in Helpston, Northamptonshire into a farming family in 1793. He came to be known as "The Peasant Poet" and is acknowledged by many as the greatest poet of the English country scene. These lines, which paint such a perfect picture of the beginning of autumn came to mind in early October as I crossed the motorway bridge on Green Lane. It was mid afternoon, the sun was highlighting the trees and shrubs lining the motorway embankments and the first glimpses of the glorious autumn leaf colours were just starting to show that much of nature was beginning to wind down before the onset of the cold winter months. These autumn colours should not of course be confused with the brown colour of horse chestnut leaves caused by the larvae of the specific leaf mining moth Cameraria ohridella, which was first spotted in northern Greece in the early 1970's and identified as a new species in 1986. It spread rapidly across eastern and central Europe and was first recorded in the UK in Wimbledon in 2002 since when it has continued spreading across the UK at the rate of roughly 50 kilometres annually. The moth, which can have a number of life cycles each year, lays its eggs on the leaf surface and when they hatch the larvae burrow into the leaves which gradually turn brown. It seems that because infestations take place later in the season they do not, over time, kill the affected trees, however the conkers are smaller. Interestingly, on the verge in Green Lane outside Little Woolborough Farm there is a beautiful specimen of a horse chestnut which does not seem to have been affected by this moth despite the fact that other trees around the village and further down Green Lane have fallen victim. It is possible this tree has a natural immunity which has been recorded in a small number of trees in Europe, in the same way as an ash tree in Sweden has been found to be immune to the ash die back fungus. As expected the crops of nuts, berries and fruits of woodland and hedgerow are abundant making this a mast year - this term describes those years when crops such as acorns, chestnuts and hazelnuts are particularly high and litter the ground beneath the trees providing a surplus of food for wild animals and birds. 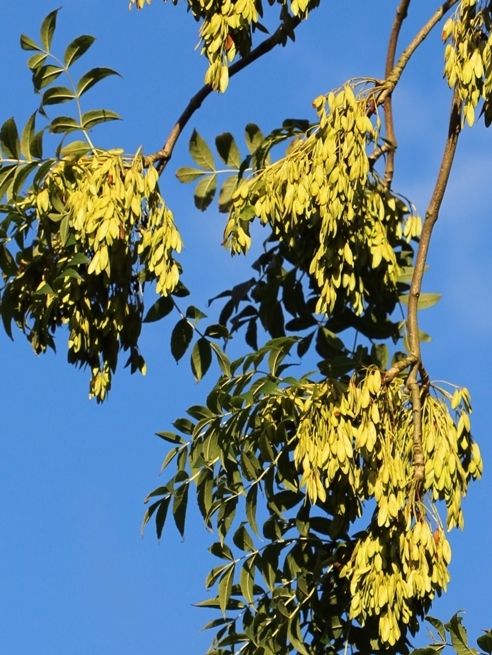 The seeds of ash trees, known as keys because they are winged and hang in bunches, have been particularly noticeable as they have ripened from green to a dazzling, bright, sunny yellow and then a chestnut brown. The bunches of keys often hang on the trees throughout the winter. Sightings this month have included a weasel spotted by David Baldock as it scampered across his terrace and a roe deer seen by Geoff Last as it crossed Brickfield Lane. Deer numbers are reported to be on the increase and the giveaway signs of their presence include hoof prints in soft mud and the nibbled shoots on newly coppiced trees.